But. I am going to just do it. 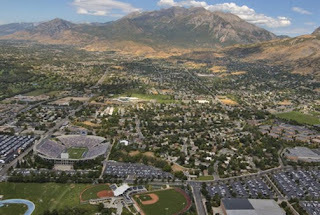 Today during my usual facebook perusal/stalking session, I saw some pictures on someone's page from Y mountain overlooking Provo and I felt a little pang in my heart. I miss that place! If you would have asked me about it a few years ago, I would have died if I would have known how much I have come to love 'Happy Valley'. Over the past 3 years though, Provo really has become my home. Not really my home because my family doesn't live there, but my home because that is where my life is. Make sense? When I come home (to Oregon), I feel like I'm on vacation from my life. It always feels good, but by the end of it, I am definitely ready to go back. Like now for example. . . Sigh, one week left. There are a few obstacles left before takeoff though, and I am not looking forward to all of them (some I am though). How I am going to get everything down to school in my little car is another puzzle that I'm gonna need to figure out. In the meantime, everybody get ready to party! We are going to have so. much. fun. this year! I posted three times today. i commented on like 20 blog posts today.